LiteOn's mission is to consistently meet or exceed its customers' expectations by providing solutions with outstanding performance, competitiveness, and punctuality. PRODUCT FEATURES: Supports Double Layer DVD+ / - R9 Recording Function;SMART-BURN avoiding Buffer UnderRun Error, Automatically adjusting writing strategy & running OPC to provide the best burning quality;SMART-X function adjusts CD-DA / VCD / DVD data extraction to a fastest allowable speed according to both data request rate from host and disk quality;VAS system reduces vibration and noise during recording and reading;Supports Fixed Packet, Variable Packet, TAO, SAO, DAO, Raw Mode Burning & Over-Burn;DVD read compliant: DVD single / dual layer (PTP / OTP), DVD-R (3.9 GB / 4.7 GB), DVD-R multi-borders, DVD+R, DVD+R multi-sessions, DVD-RW, and DVD+RW;CD read compliant: CD-DA, CD-ROM, CD-ROM / XA, Photo-CD, Multi-session, Karaoke-CD, Video-CD, CD-I FMV, CD Extra, CD Plus, CD-R, and CD-RW;Supports both 8 cm and 12 cm disc of CD and DVD family;Conform to Orange Book: Part 2 CD-R Volume 1, Part 2 CD-R Volume 2 Multi Speed, Part 3 CD-RW Volume 1 (1x, 2x, and 4x), Part 3 CD-RW Volume 2; High Speed, Part 3 CD-RW Volume 3: Ultra Speed;Supported transfer mode: PIO mode 4, DMA mode 2 and Ultra DMA mode 4;Supports Lightscribe direct disk labeling to Lightscribe media. 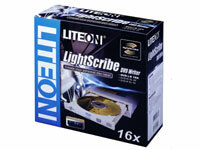 LiteOn SHW-16H5S - Disk drive - DVD±RW (±R DL) - 16x/16x - IDE - internal - 5.25 - LightScribe.